These are some of the side projects I have worked on. Below are write-ups on them. Project Name: Picture: Write-up: Brief Description: Misc. 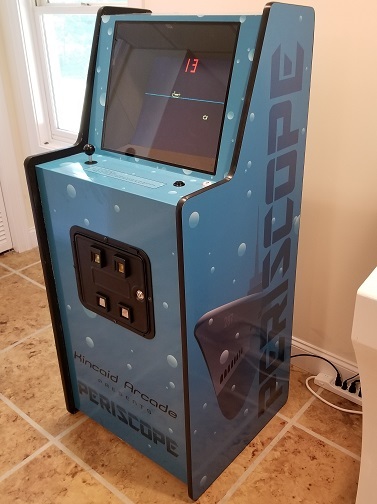 PERISCOPE, a TTL arcade game. 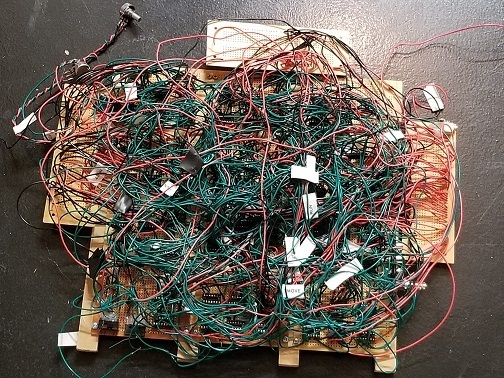 How a 14/15-year-old designed a TTL arcade game. I designed / built this arcade game when I was 14-15. It cost more than $2,300 to build. 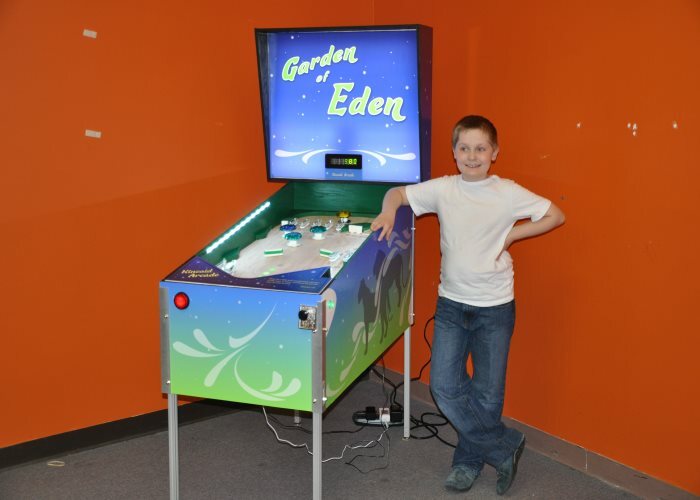 Garden Of Eden Pinball Machine How an 11-year old built a full-size pinball machine. I designed / built this pinball machine when I was 10-11. I spent over 500 hours on it. It cost over $5,000 to build, with about $650 of it in shipping costs alone. It houses 3 Arduinos and over 500 feet of wire. Right now, I am trying to figure out why the 14MHZ crystal is producing an 18MHZ signal. The game is doing about 80 frames a second, and my monitior can't handle that. Cloning Atari's PONG Back when I cloned Pong. I cloned Atari's PONG back when I was 11. It... looked like PONG. It had a bunch of problems that I never fixed. Knowing more about TTL, I think I know what I did wrong. 2015? The Pocket Encouragement Device Write-up: I know we all feel discouraged at times, so I designed a device that would provide Biblical encouragement at the press of a button. 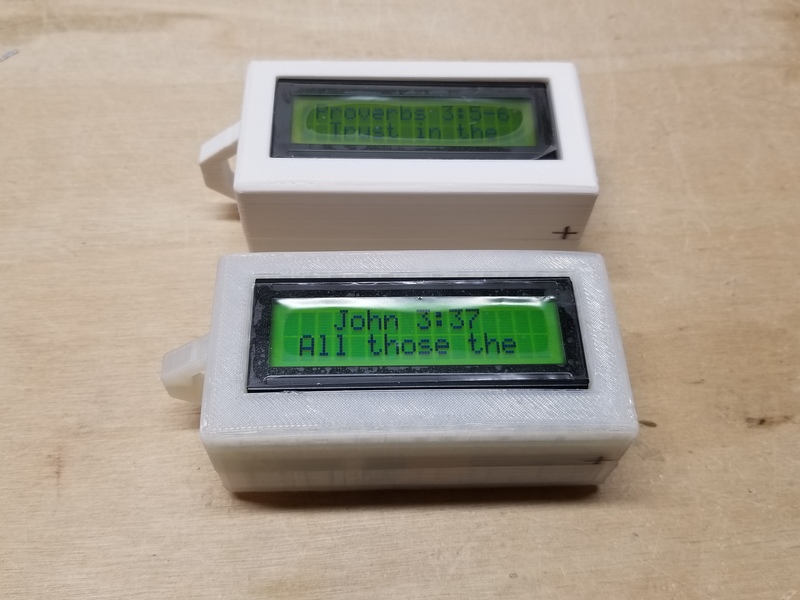 I basically filled up the ATMEGA328P's memory with 79 bible passages. ...and we were going to use perler beads to fill them. Someone apparently thought it was a good idea to buy (I did the math, I think it was 138,000) unsorted beads. They did that with the intention of having students sort them in class. That ended up occupying our next few weeks. Ahh... how did that phrase go... Penny wise but Pound foolish? I did not want to spend all of my science classes (yes, science class...) sorting those miniscule, 38-color beads. First major project I've done entirely by myself. First project I had to order components in multiples of 100. First project I had to design and order circuit boards for. First project to exceede 50 pages of arduino code. Autonomous Rover Picture: Write-up: A little rover I built for school with the purpose of navigating mazes. First major project I did. It had several infra-red sensors to make sure that it did not hit any obstacles. Kinda funny when you think that my school project next year was a full-sized pinball machine! Electric Go-Kart Picture: Write-up: This project was a flop. The goal was to learn how to use a CNC machine, but my Dad didn't finish building his CNC machine before the end of the school year, so I had to hand-carve something. We all know how bad I am with art, (I seem to be limited to curves, trapezoids and ovals.) and that, with such a lack of time to accomplish it, was probably why I failed so miserably. On the bright side, I am pretty good with 'advertising' my projects, so I still managed to wow everyone at the exposition anyway.